Great content it’s the first step but it’s not enough. You also need content that search engines can index properly and this is what content optimization is all about. In this post you will learn how to optimize your content correctly by avoiding deadly mistakes. The Web is loaded with information presented through different types of content; text, images, video and audio are the most popular types. 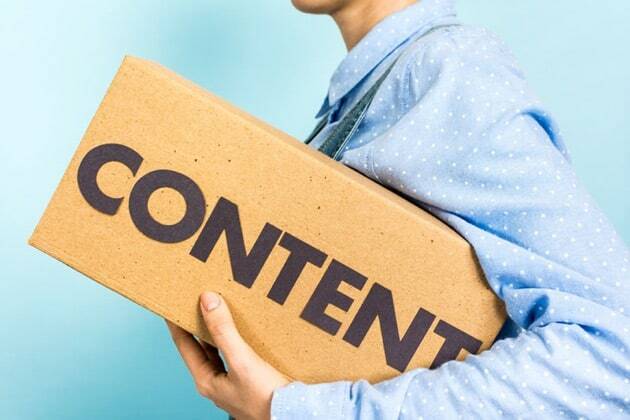 Content is also referred to as ‘copy’ and the process of optimizing content as ‘copywriting’ or ‘seo copywriting’. In general, content optimization is the process of making the content of a website more attractive to search engines and users. You can do this by following certain rules that will make the job of search engine crawlers easier while at the same time making it friendlier for users to understand and interact with the content. Throughout the whole optimization process you should remember that your primary goal is to make the user experience better. Any improvements you do on the content is for the user and if you do this right, search engines will follow. Let’s see how you can optimize the most common types of web content: text, images and video. Page title: The title tag is perhaps the most important element of optimization. It does not only give a very good clue about the content of the page but it is also shown in the SERPS and in social media postings. Include keywords you are targeting in your content within the title but avoid keyword stuffing. Since the title tag is what is shown in the search engine result pages, make it interesting for the user so that they would want to click. Each and every page of your website needs to have a unique title. Important: Try to differentiate your title from existing titles that are already present in the search results. Before deciding for your title, search your target keywords on Google and study the results in the first page. One of the things you will notice is that all titles are unique and this is because Google wants to show a variety of results in their first page. Another thing is that titles that have the words ‘tips’, ‘guide’, ‘How to’ and numbers tend to dominate the results. Take a look at the results when you search for ‘content optimization’. Page Descriptions: The page meta description tag may be shown by search engines in the search results. I say ‘may be shown’ because it’s up to Google to show your description or come up with a custom description (taken from the content of the page). While there is no way to force Google to use the description you create, if your description is not within the recommended length (140 – 155) then Google will definitely come up with a custom description. 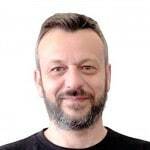 So, to increase your chances of controlling how the description of your page appears in the SERPS, keep the length up-to 155 characters and make sure that it is unique and that is represents the content of the page correctly without keyword stuffing. Content formatting and H1 tags: Besides the titles and description another important part is obviously the content of the page. Throwing a lot of text in a page without taking care of the formatting will not do any good. Users will not be able to read it easily and search engines will have a hard time understanding what the page is about. Make sure that the title of a page (or post) is tagged with H1. H1 is the main heading of a page and this is usually used for the title. A page should have only one H1 tags and the rest of the headings can be h2 and h3. Think of it like a book where you have a title (h1), chapters (h2) and sections within a chapter (h3). Make use of small paragraphs, bold and italics. Small paragraphs are easier to read, especially for users that like to skim read through the text. Use bold and italics to highlight certain phrases in the content that need the attention of the user. 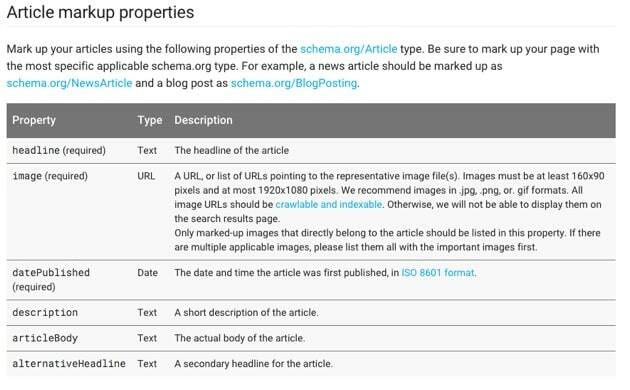 Schema (Structured Data): All major search engines have agreed to a common format of representing data and this is known as structured data or schemas. Structured data is a way to describe your content to search engines by adding certain tags to the html of the page. These tags are not visible by users but they are read by search crawlers. There are schemas for almost any kind of content you can image, from recipes to hotel information and articles. You can view the complete list in schema.org website and also in Google’s structured data documentation. Basically with schemas you pinpoint important elements of the content to search engines. For example if you are selling products, you can specify the name of your product, brand, price, images, availability, condition, reviews and a bunch of other elements that will help crawlers index your product pages better. There are also schemas for articles, where you specify the author, content, description, featured image and title. The best way to check if your current website theme implements schema is to use the structured data testing tool. Enter your url in the FETCH URL box and click FETCH & VALIDATE. Google will show you on the right hand site what it can understand from the page and any errors that you need to fix. Adding schema support to a website requires technical knowledge but doing so can certainly help you improve your SEO and stay up-to-date with latest development. If you don’t know how to do it, you can hire a developer to do it for you. It will cost you but it’s something that you need to implement. Images can make your content easier to read and less tiring especially in cases where you publish long articles. Always include text with your images. A page full of images and no text is not a good practice, unless it’s a photo gallery page or a supporting page (i.e. not one of your main website pages). Each image should have a meaningful filename. For example if you have an image that shows a horse, then name your image ‘white-horse.jpg’ and not ‘wh1231.jpg’. Each image should have a unique ALT Text. Alt text is what search engines can read from the image and this has to be short and unique for each image. It is also the text shown to the user until the image is fully loaded in the browser. It is good if you can add your target keywords in the ALT text but don’t overdo it. How many images to use in your content? Some people suggest using one image every 300-400 words but in reality there is no guideline as to the number of images a page should have (besides the rule of thumb below). Use images where appropriate and when it matters. As a rule of thumb make sure that you have at least one image per post since this is needed by schemas and also in other cases like when using the new Google Adsense Matched content ads. Drawbacks of using images in the content: While images are good for SEO and readability, they have 2 drawbacks. First is when using a lot of images in a page, this adds to the loading time and this is not good especially for mobile users. Solution: Use a Content Delivery Network (CDN) to deliver images to the users and also decide whether or not to hide some images from mobile users. In pages that I have a lot of images in the text, I sometimes hide them on the mobile version of the site so that users on mobile work faster. On website’s that you run Adsense, images tend to grab the attention of the users and so less attention is given on the ads. Solution: To maximize your adsense earnings, try not to have images close to the ads. You can start your post with an image but then give some space to the ads and then as you go deeper to the content of your page, you can add more images. Adding videos to your pages makes your content more interesting. A lot of people like to view a video rather than reading a long text article. Similar rules to images apply when adding videos to your website and in particular. Make sure that your video’s are short and to the point. When creating a video you need to get the attention of the user from the beginning to the end. A video the explains a concept is not a movie that needs to have a story but it should be short and very specific. Videos can really slow a website down so don’t try to stream the videos from your website but use a streaming service like Youtube. You can easily create a channel and upload your videos in youtube and then add the embed code to your website. Make sure that your videos are not set to auto play. This is distracting and frustrating for users (especially mobile users). Make sure that your videos have proper filenames, good titles and descriptions. Search engines cannot view the videos and understand the content but they use the data you give them in the filename, titles, descriptions and keywords to figure out what the video is all about. Besides the above guidelines there are a few more rules you need to have in mind when optimizing your content. Avoid duplicate content: Content duplication is normal and can occur in many situations. The most common is having duplicate content within your website either because of your archive pages or because of the way your website is structured. This is not very bad and Google will not penalize you for this but it makes it more difficult for them to understand which are the most important pages of your website that need to be included in their index. To bypass this problem and optimize your content better, make use of Sitemaps to let them know about your important pages and also of canonical urls. What is bad, is having content on your website that was previously published on other websites, even if you link back to the source. You need to understand that in order to rank your website higher, it needs to have lots of original and unique content. Search engines can understand and credit the website that initially published a piece of content and discard websites that don’t have original content. So instead of copying content from other websites, spend your time and effort to publish good content on your website that will make it strong and give it a push in the SERPS. Internal and External links: Links are very important in the whole content optimization process. You need both internal and external links. Internal links indicate that you content ‘fits’ within the theme of your website and the rest of the published content and external links are ‘votes of trust’ from other websites. Both of these signals are used by search engines when calculating the ranking position of a page for a particular keyword. Keyword stuffing: I have mentioned many times above the phrase ‘avoid keyword stuffing’ and this is because you no longer need to add your keywords many times in the text. This is not SEO but spamming. Search engines are clever enough to understand the context of a page and over optimization can get you into trouble. I know that this sound confusing because on one hand we say optimize for both search engines and users and on the other hand avoid keyword stuffing. You need to find the right balance between the two and this comes only with practice and by examining the first pages on the SERPS for a given keyword to understand how Google intepretes ‘context’ for the keywords you’re targeting. 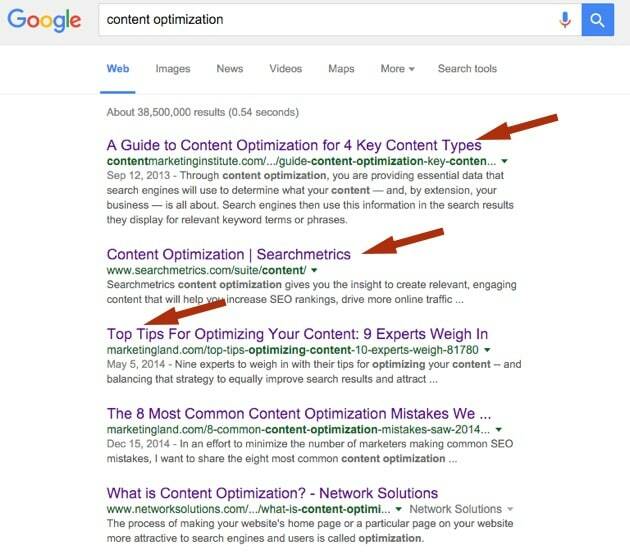 The takeaway from this post is that content optimization is important but also very easy to do. Once you get into the habit and work on your titles, descriptions, main body content, images and videos before hiding the publish button, everything else will naturally follow. Keep publishing good quality content on a consistent basis and you will notice that gradually your website or blog will get noticed by search engines and your traffic will increase. It’s not easy to do but it’s the only way to get concrete results both in the short term but most importantly in the long term. Thanks Alex.I got a good knowledge about seo copy writing and optimizing a content.I’ll always follow these steps. 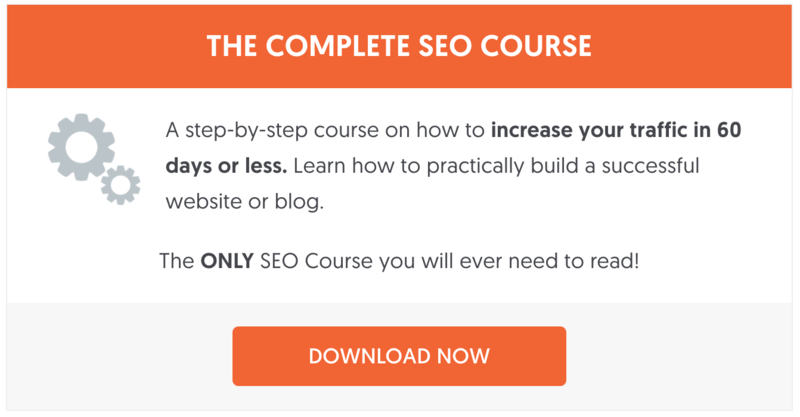 Follow the steps consistently and monitor your keyword rankings. You will see that over time they will get better and better.